Disclosure: I received a quilt from Two Little Fish for review. All opinions are my own. I have always loved handmade items and still have a baby blanket from when I was a wee one. Since my sewing skills are way below par, I can only drool over all the neat quilt designs I see and dream of one day making one. If and until then, Two Little Fish has the most amazing bedding designs for your little one while doing a world of good along the way. Two Little Fish bedding sets are handcrafted in Indiana using a combination of American fabric and hand-dyed fabric from village women in Ghana, Africa. Their mission of "Putting Poverty to Bed" is heartwarming and inspirational. Can you imagine your baby/child not having a place to sleep? I simply can't imagine and everyday I am thankful that I am blessed with so much. If there is ever a moment when you think things just can't get any worse, take a breath and see all the things that you should be grateful for since there are many that go without even the basics. I was drooling over the fabulous fabric options and put together several that I thought would make a fantastic quilt for Kenzie's new big girl bed. When I opened the package and saw my choices designed into an amazing quilt, I was speechless. The detailing is immaculate and even though it's a mix of patterns, it really blends well to form a special piece to be cherished. 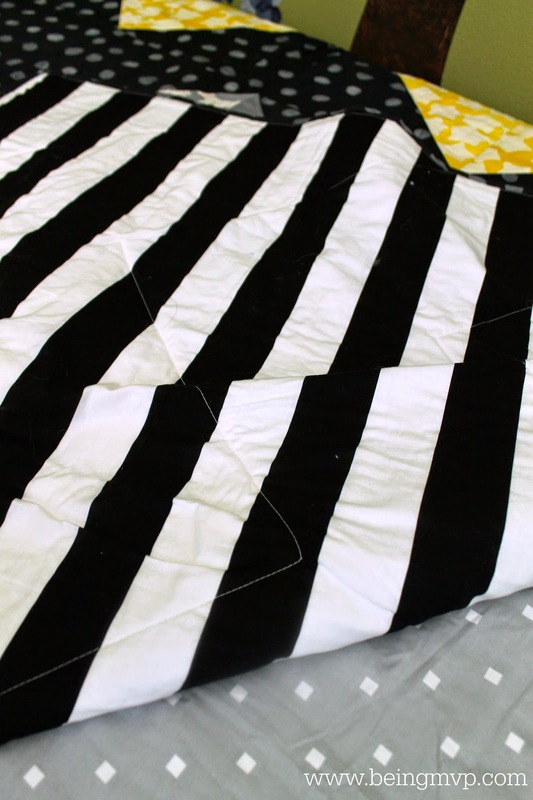 I love that there is a a black and white stripe backing to make it reversible. Kenzie absolutely loves her new "blanket" and when she crawls into her bed, I am still reminded that she is a little girl and not as grown up as she proclaims. I hope that one day I will see her take this special Two Little Fish quilt off to college on the next chapter of her life! Two Little Fish will work with you to create a one-of-a-kind treasure. They offer everything from crib and twin sets, wet bags, crib blankets, playmats, buntings, crib sheets, quilts and the most precious ruffles I have ever seen! 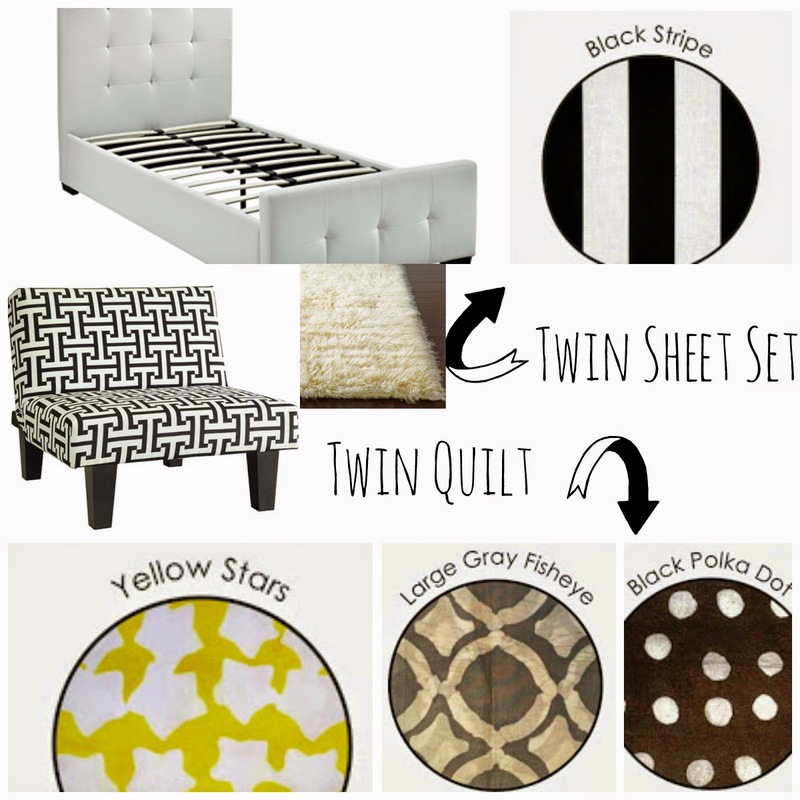 I really want to get Kenzie some black and white stripe twin sheets soon. What sort of fabrics would you put together to design your dream quilt from Two Little Fish? I love the black stripe and black polka dot designs, very cute! What a great new look for your little one as she grows up! Love the idea that some of the fabric is created by women in other countries trying to better their families. I am checking out their site right now. Wow, I love how unique and vibrant this quilt is! Her room looks adorable! So cute! Love the colors and the bed his really modern and adorable! I love that quilt. I will have to check out this website and thank you for sharing! What a great makeover! I love their Block Twin Quilt teal/purple/grey combination! So cute, but not too girlie! I love it..such an awesome makeover, love the colors.. thanks for sharing, will have to check it out; currently thinking about a makeover for my daughter, so perfect timing for your post. It came out awesome!! I am loving that bedspread that you picked out! What a cute room makeover! It looks great, and I love the wall sticker. Too adorable! I love the pattern on the quilt and the pattern on the wall. What a fantastic looking room. Oh my gosh. That is adorable. I love the patterned quilt! That is a beautiful quilt. I love how bold it is with the splash of yellow. OH that looks so stinking cute! I love the quilt! It really brightens the room! Love the makeover and really love the wall decal. That is adorable! I love how it works now and will transition nicely when she's older! Going to go check their site out now! I think her room looks great! I love supporting companies that give back! That room turned out great. It's super adorable. I love the pink wall art next to the black and white bedding. It's child chic! That 1 is really cute! I'm loving the company that gives too! Oh I love it! That quilt is fantastic and her room looks grea! That is awesome... when I was younger I had pink and purple poka dot bed spread and pink and purple stripped curtains. I loved it. Her room is incredible! I love the comforter because it is so unique. I am going to look into this for our guest room that we are completely re-doing. That is one beautiful quilt and I simply adore ADORE that bed!! What a nice room! That room is so cute. 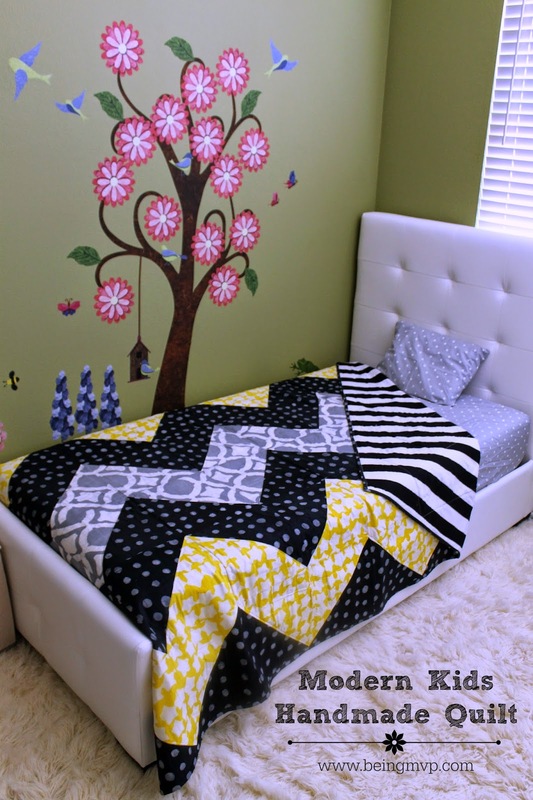 I love the chevron design on the blanket and the adorable tree on the wall. It's great. I love this, very chic and modern. The colors all tie in nicely too! This make-over turned out great! I love the wall art. 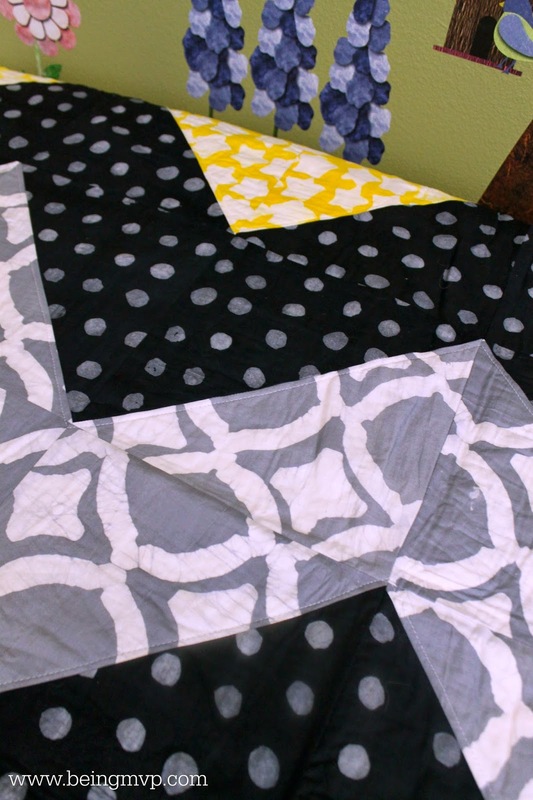 What a great idea to pair something simple as decorative bedding with a worthy cause. Love how the quilt turned out. I really love how you can make it just the way you want. The varying patterns are so neat! Wow, that is a gorgeous quilt! I'm lucky enough to have some family members who have made quilts for me. There is nothing like a beautiful handmade quilt. I love the prints combos. Great choices. What a unique and awesome quilt! I've made simple rag quilts for my boys. What a nice room! The colors are gorgeous! What a cute makeover you have done. I love the blanket! Sewing was never my strong suit, either. Both of my grandmother's were wonderful sewers and I have some of their work and cherish it. I think my favorite part of this process is that the purchaser gets to participate in the making of the quilt by choosing the fabric. OMG I Love this idea!!! I love companies that give back or help the needy in some way. I have also been wanting to make a quilt and I don't know how. I will check out Two Little Fish and I'm very excited about it. Thanks. Awesome room. I love the wall decals! The quilt is just beautiful! I love the mission of "Putting Poverty to Bed"!